Do you really want to know how to make seolleongtang? At this point, I have to confess, if I had not already told the whole world I was writing a cookbook, I might just quietly slink away. But since I have, and we must finish, I thought I’d share some of the difficult questions that have been paralyzing us. Seolleongtang is one of my favorite Korean foods. To put it most simply, it is a soup made of ox parts, including bones, boiled until the stock takes on a milky-white color. Koreans eat it for breakfast, lunch, or dinner, because it is so soothing. When it comes to the table, you might dismiss its weak flavor. But once you add lots of scallions, coarse salt, fresh pepper, and the sour intensity of radish kimchi, the soup comes alive. Seolleongtang in Korea is cheap. My mom occasionally made it at home on a whim, but it was so easy to go out and buy a hot bowl for $5, there was no reason to make it at home. You don’t even have to go out of your way to eat a fantastic version. I have a strong memory of being 8 years old, going to Seoul for the summer, and escaping the hotel’s overpriced and yucky Western breakfast to eat seolleongtang in an alley, and thinking it was one of the best breakfasts I’d ever had. In New York, there is a famous restaurant on 32nd Street that specializes in seolleongtang. Gahm Mi Oak is good, not great, like most food on that street. So the question for me was, is my homemade seolleongtang so much better than Gahm Mi Oak‘s that it’s worth making at home? Or given that this cookbook is meant for an audience of someone than than me, how good would homemade seolleongtang have to be for you to make it at home? Don’t answer until you hear what it takes. My mother, on the other hand, said all we needed was brisket and a beef shank bone cut into pieces. So we bought a giant bag of beef bones. We soaked the bones for an hour or so to drain the blood, which makes the broth clearer and cleaner. Then we put the soup bones in the pot with water, brought it to a boil, and let it simmer. After two hours, we removed the bones from the pot, trimmed the meat and tendon off the bones, set aside the broth, and then put the bones back in the pot with more water. After another two hours, we removed the bones, poured out the broth, combined it with the earlier broth, and put the bones back in the pot again with more water. After yet another two hours, we did it again. We also made a separate broth at some point with a good cut of brisket, which we combined with the bone broth at the end. The end-result was a pale, milky color, though not as opaquely white as I’m used to. My mother said, “I think the restaurants color their soups.” Hmm. It was tasty, but not earth-shattering. I would rather take the subway to 32nd Street. I wondered if it were possible to make it in a less complicated way. It’s one thing to boil a pot for hours, another to have to watch it constantly. So the next time, instead of following my mom’s careful boil and drain, boil and drain instructions, I just boiled the bones for 8 straight hours. It tasted pretty good, but the soup didn’t turn white at all. And now, I am sitting here wondering if I should go try to find some ox knee bones and gristle and try yet again. But even if I found ox knee bones and gristle, and made an absolutely delicious and perfectly white seolleongtang that had to be soaked and/or boiled for 10 hours, would you be interested in that recipe? Or would you rather be provided a simpler recipe with more easily sourced cuts of meat that’s tasty but not really the right traditional color? And even in that case, would you be willing to boil the damn bones, shifting them in and out of the pot, every two hours for 8 hours? That’s practically like feeding a newborn. You know that saying, “Too many cooks in the kitchen spoil the broth?” That’s what writing a cookbook is like, sitting in a kitchen with hundreds of invisible cooks whose minds you are desperately trying to read. A friend of mine recently told me that she thinks the title of my blog is a little lonely. It is, isn’t it? It made sense when I was traveling alone and generally eating alone, but it’s definitely not a way of life that I espouse. I’d rather have ten people over for dinner than eat alone, which is good because I’m now doing that every Sunday. Korean food isn’t hard to eat alone, at least if your mother has already stocked your fridge. So much of Korean food is meant to be eaten over days, if not weeks and months. We are masters of food preservation. It’s so easy to cook a quick pot of rice, and then sit down with some kimchi, roasted seaweed, and maybe some sweet and spicy dried squid or soy sauce-sauteed anchovies. Simmering part of the stock for seolleong-tang. But Korean food isn’t meant to be eaten alone. A Korean meal isn’t complete without soup, but you can’t quarter or even halve the recipe and expect to have a full, meaty tasting broth. Even the 반찬, banchan, the little dishes of salty and spicy food that are scattered all over the table, are meant to be shared. You’re supposed to have variety, a little bit of a lot of different things, which is only really possible when you’re eating with other people. Over the years, I’ve gotten resourceful about using my freezer, but my favorite cabbage soup doesn’t freeze well, and by the third day of eating it, it is no longer my favorite soup. So when I came back from Korea, I realized several things in my life had to change. I rearranged my cupboard, moving all my pasta, tomato paste, Aleppo pepper, and French green lentils to the top shelf, so I would have enough room for all the Korean rice, red beans, millet, dried anchovies, and crushed red pepper I needed. The soy sauce and sesame oil are now in closer reach than the sherry vinegar and olive oil. I’ve stopped cooking non-Korean food at home, other than the occasional breakfast burrito, because I feel like I need to be thinking and eating like my mother if I’m ever going to come close to cooking like her. And since I don’t have a family of four to feed everyday, as she did for so many years, I’m now hosting Korean Food Sundays, a Korean meal every Sunday night of this year. Experimenting with persimmon vinegar v. apple cider vinegar for spicy radish strips. It’s open to all my friends who came to Soup Night last year (the monthly pot-o-soup event I used to do) and any of their friends who are willing to eat experimental Korean food in Brooklyn. It’s a little nerve-wracking because I have to focus more on doing research than on being a good hostess. I’m going to cook dishes that I’m not sure non-Koreans will like, and I’m going to cook things I’ve never made before because I have to learn. I’ve warned all my friends that there may be emergency pizza nights, but the first night was a lot of disorganized fun. 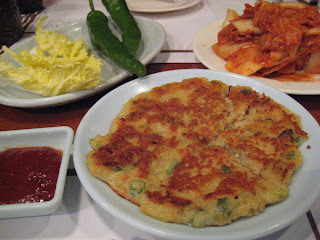 It was low-key by Korean standards: 설렁탕, seolleong-tang, a milky-white oxbone-soup and 감자전, gamja-jeon, or Korean-style potato pancakes. Then a spread of banchan: two kinds of homemade kimchi, radish and cabbage; dried pollack braised in soy sauce; glazed lotus root; dried squid sautéed in sweet red pepper paste; pickled wild sesame leaves (also called perilla and a milder cousin to Japanese shiso); sweet soy sauce beans; fresh spicy radish strips; and bean sprouts seasoned with scallions and sesame oil. I can’t take credit for it all—my mom and I made a lot of the banchan before she left, as well as part of the stock for the seolleong-tang, simmering it for 8 hours one day. And I had to scratch pan-fried croaker fish off the menu when my potato pancakes started sticking to the pan and falling apart 45 minutes before people were supposed to arrive. (But I figured out what was wrong with the pancakes—it was the pan.) I spent most of Sunday cooking, which made it even more amazing that it’s the kind of meal my mom used to put on the table everyday. 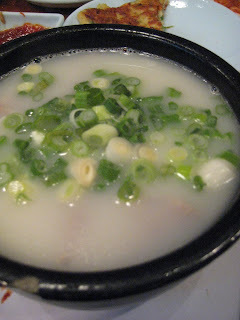 I was nervous about the seolleong-tang, which is one of those Korean soups that is literally bland. You’re supposed to season it yourself at the table, with plenty of coarse sea salt, lots of chopped scallions and freshly ground pepper. It’s actually quite a good lesson in how salt brings food to life. You eat seolleong-tang for the subtle depth of its flavor, the bones that have been simmered for so long the marrow has completely leached out, rather than for any taste that’s going to knock you out. The milky-white color only appears if you’ve simmered it long enough, which is why dishonest restaurants will sometimes add milk to it. Seolleong-tang is also a good example of how Koreans seek balance in their table—given how salty and spicy so much of their food is, many of their soups are the milder, more soothing part of the meal. But people enjoyed it, and one friend ate two bowls, though then again, he always eats two bowls. I was pleasantly surprised by how much of the dried squid and all the other funny-looking banchan got eaten up. And I was absolutely thrilled by how my new 10-cup Sanyo rice cooker performed. It is beautiful, it is perfect, and it is on sale on Amazon. I miss the ease of Soup Night in a way. I was going to try to start a movement of Soup Night, people coming together for something as simple as a pot of chili, instead of just elaborate, semi-macho meals. I even got quoted in ReadyMade magazine, talking about the connection between Soup Night and M.F.K. Fisher. (Isn’t that so funny?) But I feel lucky to have so many friends who are willing to take a chance on my cooking, especially with a cuisine full of dried things from the sea. Wouldn’t “Ten Pairs of Chopsticks” be a good name for a blog? Maybe next time. My last night in Madrid, I ended up tapas-hopping with a fellow chowhound from the New York region. He had seen my blog and was very complimentary. I was particularly flattered when a week or so later, he suggested that I submit my blog to the James Beard Foundation awards, in the category of new media. He even offered to pay the $100 application fee. I turned him down, partly because the previous winners were real food journalists, but mostly because I don’t really want to be a food writer. I don’t think food is really that important. I write about food, in a world where every schmuck has a blog, because right now, I don’t know how else to talk about the things I care about. I don’t know how else to show and not tell that I love my mother, that I miss my friends who’ve moved away, that I value things made with care and by hand, that I love traditions that are proud but alive with change. It’s like the most over-used MFK Fisher quote, “It seems to me that our three basic needs, for food and security and love, are so mixed and mingled and intertwined that we cannot straightly think of one without the others. So it happens that when I write of hunger, I am really writing about love and the hunger for it, and warmth and the love of it and the hunger for it…and then the warmth and richness and fine reality of hunger satisfied…and it is all one.” Such a poor example of her writing. It’s so much better to read the rest of “Gastronomical Me,” and see what a filter and prism food is for the things that really matter to her. And it’s so much better for me to stop this paragraph now and tell you what I ate in Koreatown last Friday. I asked my friend to meet at Gam Mee Ok on 32nd Street because I’ve been craving Korean food like a pregnant woman since I left Seoul. Even if I don’t eat a Korean meal everyday, I dip into the kimchi in my fridge almost everyday, the way I used to snack on olives or bits of cheese. I’m sitting here now with a glass of wine and a bowl of my homemade radish kimchi. Everything looked fine. There was their famous kimchi, fiery red-orange, with cabbage all mixed in with the giant chunks of radish. There was the clay jar of sliced scallions, the little pot of salt to add to the sullongtang, or beef stew, the specialty of the house. But the soup tasted flat. The rice in it clumped unappetizingly together. The broth had no body, and no amount of sharp scallions or salt or pepper was going to save it. The noodles were mushy. I ate nearly all of it anyway, beggars can’t be choosers, but I was so disappointed. Even the kimchi was bad, sour and not in a good way. Gam Mee Ok had always been one of my favorites, the best place to go if your Korean friends have kept you out till 4 a.m. in a seedy karaoke room. Clearly, those memories of fabulous hot beef soup are very, very old. It may be that the place has gone downhill, or it may be that I am too fresh from memories of my mother’s superlative cooking. But it’s definitely another spur to make Korean food happen for myself.